This place is the stuff of legends. A prehistoric city carved into pink sandstone cliffs, surrounded by mountains and trickling with secret tunnels and passages. Replicas of its amazing caverns, tombs, and temples have starred in films, books, and video games. We’re talking Indiana Jones. Lawrence of Arabia. Civilization V. Oh, and it is now included in the Seven Wonders of the World. Petra, this ancient city of stone, featured elaborate temples, theaters, a mysterious treasury, and housed almost 30,000 residents. Because of its location between the Red Sea and the Dead Sea, a succession of ancient civilizations (including Arab, Syrian, Egyptian, and Greco-Roman) significantly influenced the culture and architecture in the city’s early years. 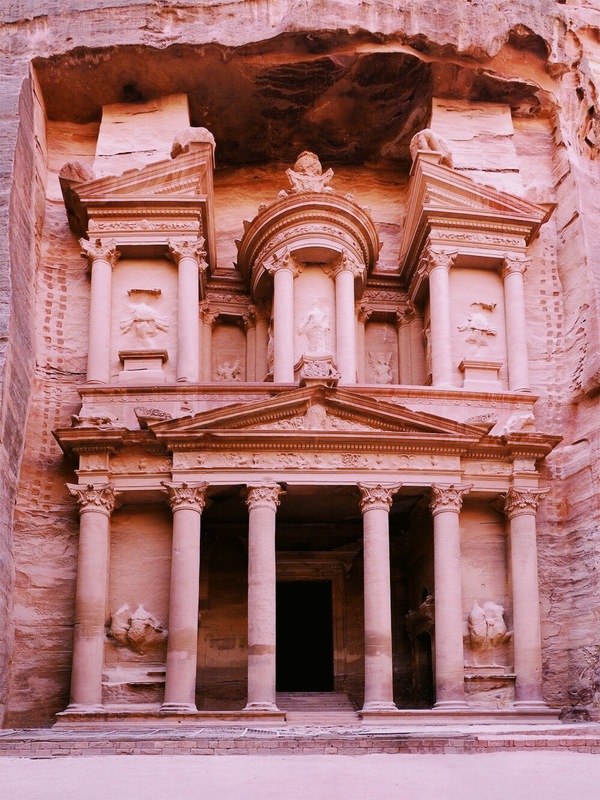 Situated in what is now the southern corner of Jordan, Petra was lost for centuries, abandoned after a series of major earthquakes and some good old-fashioned conquering in the 500s/600s A.D. It remained relatively uninhabited until it was rediscovered and then excavated in the early 1900s. Just how old is Petra? The answer is we simply don’t know. Its age has still not been agreed upon by scholars and archeologists. Some argue that the settlement dates back to 6000 B.C. Confirmed evidence dates it to 300 B.C. when it was the capital of the Nabatean Kingdom. But because only about 15 percent of the city has been excavated so far, most of its mysterious clues remain undiscovered and underground –– making this a prehistoric puzzle that has us both immensely fascinated and epically curious.